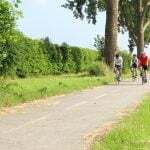 Join the Bruges Cycling Weekend with More Adventure! 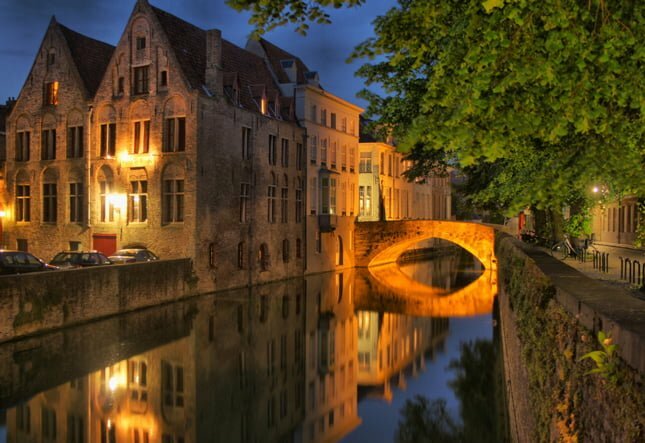 Experience the cycling bliss of Belgium whilst being based in Bruges, arguably one of the most beautiful towns in Northern Europe. Over four unique cycling days you’ll explore fabulous canal paths and cycle lanes, visit medieval the cobblestone streets of Ghent, cycle through the Menin Gate in Ypres, and have plenty of time to relax in the restaurants and bars of Bruges each evening. During this trip we’ll be based in a lovely hotel just a few hundred metres from the popular market place in the town centre. 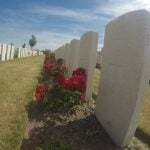 Please scroll to the bottom of this page to view our open trips, or alternatively get in touch if you have a small group of people who may be interested. Experience the cycling bliss of Belgium whilst being based in Bruges, arguably one of the most beautiful towns in Northern Europe. 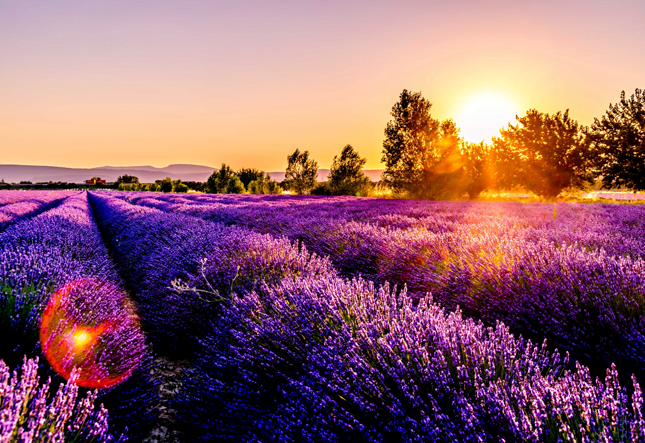 Over four unique cyclings days you’ll explore fabulous canal paths and cycle lanes, visit medieval the cobblestone streets of Ghent, cycle through the Menin Gate in Ypres, and have plenty of time to relax in the restaurants and bars of Bruges each evening. During this trip we’ll be based in a lovely hotel just a few hundred metres from the popular market place in the town centre. On the final day we’ll cycle back to Dunkerque where our cars will be parked and board our ferry back to the UK. We meet in Dover where we’ll load luggage onto the support van then get a morning ferry to Dunkerque. 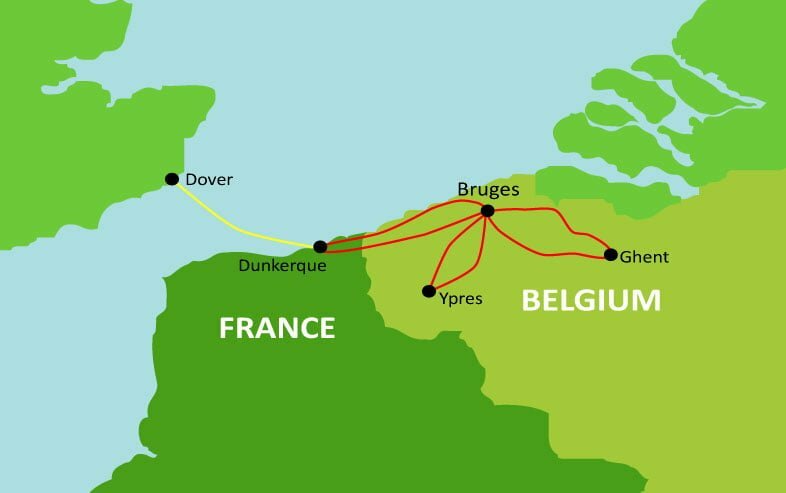 Once we’ve arrived in France we’ll cycle to the Belgian border then along the beautiful coast before cutting inland to Bruges. Here we’ll have our first evening meal and spend our first night in this magical city. This morning we head south out of the town to join and follow the Ghent-Bruges canal southeast to the city of Ghent, one of Belgium’s best kept secrets. 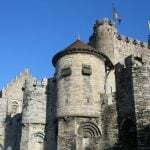 We’ll cross over St Michael’s bridge and into the centre of this vibrant and historic city to Gravensteen Castle, the Castle of the Counts. 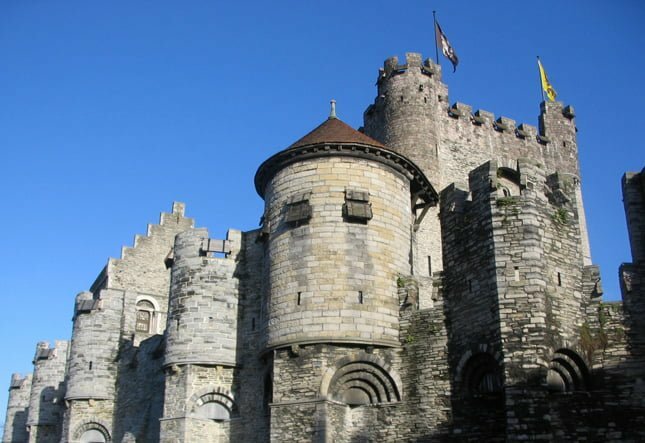 This beautiful medieval castle was built in 1180 by count Philip of Alsace and boasts a moat, turrets and arrow slits, an imposing and impressive piece of history at the confluence of the Lieve and Leie canals. We’ll leave the city the north through the town of Evergem then skirting around Maldegem, briefly joining the Leopardsvaart canal, then back to Bruges. Our ride today begins through the delightful south-western suburbs of Bruges and through beautiful woodland to the small town of Aartrijke. From here we head through farmland through Torhout then stop for coffee at the village of Gits. 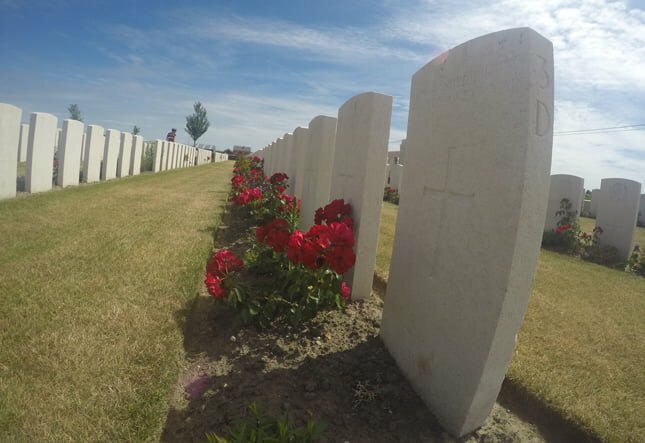 We’ll stop at two very different cemeteries this morning, the immaculate Passendale New British Cemetery and the dramatic German War Cemetery of Langemark, both stark and moving reminders of the region’s battles during World War I. 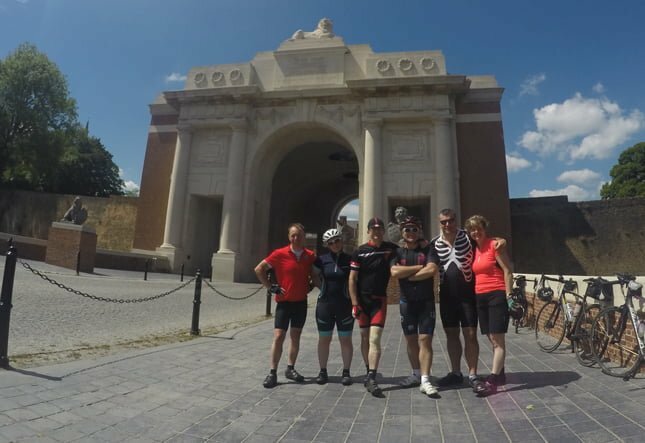 A few miles on we enter the beautiful city of Ypres through the iconic Menin Gate, a memorial to just nearly fifty-five thousand soldiers killed in the battle of Salient-Ypres. We’ll stop for lunch under the imposing Cloth Hall, a UNESCO World Heritage site, and soak up the atmosphere of the stunning Grote Markt. 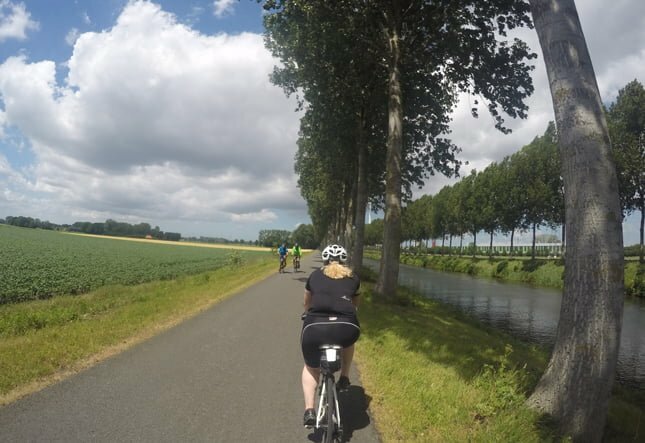 After lunch we cycle along several incredible canalside cycle paths and country lanes back to Bruges for our third and final evening in the city. 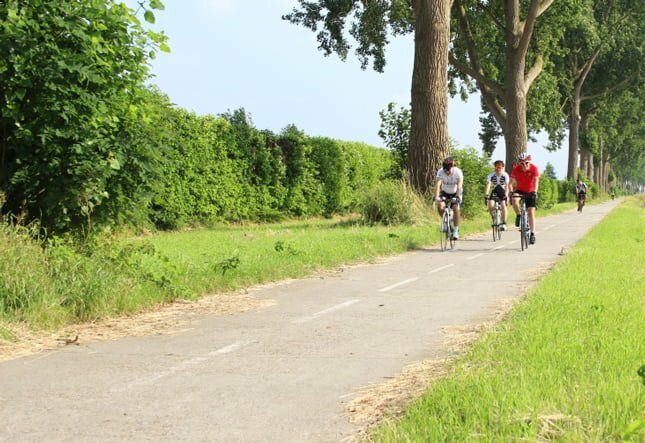 Our final day’s ride leaves Bruges to the west alongside the Gent-Bruges-Ostende canal, a popular route out of the city. We’ll stop for lunch in the pretty town of Veurne, with cobbled streets and typical Flemish architecture lining the main square. We continue west to Dunkerque where we’ll board our ferry back to Dover. Here, the trips ends and we say our farewells. Single room supplement is £180 and you can add this upon booking. *Single room supplement is £180 and you can add this upon booking. Can we leave our cars at Dover? Yes. Once you've signed up to the trip we'll forward details on secure car parks in Dover that you can leave your car. Can we stay in Dover the night before the trip begins? Yes there are plenty of hotels to stay in Dover. We recommend one of the Premier Inns (there are a couple! ), details can be found in the Joining Instructions. Can we have breakfast on the ferry? This isn't a problem, there is a restaurant on the ferry and is probabaly a better idea than rushing your breakfast in the hotel. Do we ride onto the ferry? Yes, so you'll need to arrive ready to ride. Are there group meals every night? 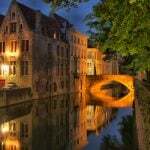 There will be a couple of group meals, but you'll also get the opportunity to choose other restaurants and explore the fantastic city of Bruges on a couple of nights too.